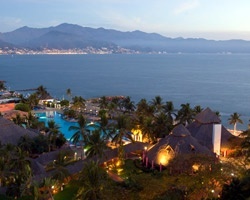 The *Melia Puerto Vallarta* is a four star family resort located in the exclusive Marina Vallarta Yacht and Golf area, 5 minutes away from the airport and 15 minutes from downtown. It is a great value property for families on a budget. 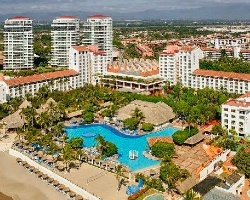 The Melia Puerto Vallarta boasts the largest pool in Puerto Vallarta. It is a large free form pool designed after a creation of Picasso. The swimming pool sports a swim up bar and children's play area. This resort is all about pool people! 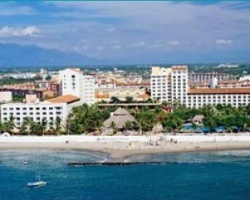 The All Inclusive Plan at the Melia Puerto Vallarta includes all meals served buffet style at your choice of three restaurants, some with optional a la Carte dinners with reservations. Dress is casual sportswear but gentlemen are required to wear long pants in the evenings. Room service is available from 7am until midnight. There are also three bars serving unlimited domestic and imported drinks. 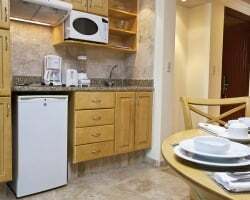 There is nightly entertainment, non-motorized water sports, two lit tennis courts, shooting range and even a cyber cafe. Option to Go Anywhere within the Melia Resorts! Sale Includes 20,000 Biennial Even Points! RTU Until 2063! Owner Will Consider All Reasonable Offers! Option to be all inclusive! Steps away from the beach! Buyer May Receive A Title Fee Credit, Inquire For Details! Within close proximity to various activities! rtu until 2063! Explore Mexico during any week you desire! RTU until 2038! Buyer May Receive A Title Fee Credit, Inquire For Details! Explore Mexico year after year during any week you choose! Buyer May Receive A Title Fee Credit, Inquire For Details! RTU until 2020! Floating week every year. Yearly usage in floating, Gold season week! RTU until 2029! Price negotiable! Motivated Seller~Includes 14 Bonus Weeks! Option to go anywhere within the Melia resorts! Owner will consider all reasonable offers! 19,000 annual points! RTU until 2063! Buyer may receive a title fee credit, inquire for details! Explore Mexico during any week you desire! RTU until 2027! Buyer may receive a title fee credit, inquire for details! 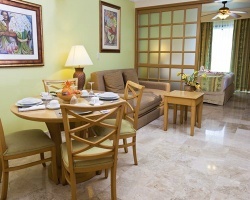 Beautiful resort with luxurious amenities! Floating week! Buyer may receive a title fee credit, inquire for details!